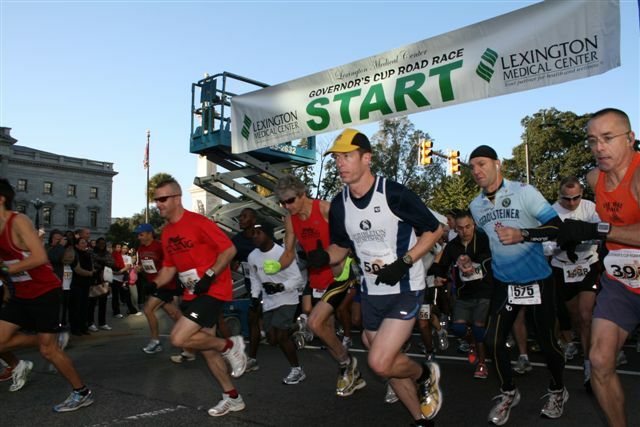 Lexington Medical Center is pleased to be the title sponsor of the 2010 Governor’s Cup Road Race, featuring half marathon and 8K races in Columbia on November 13th. Our hospital enjoys events that encourage healthy lifestyles. Several Lexington Medical Center employees are training for the half marathon. We’re following two along the way. Between now and race day, our blog will bring you the stories of their training. First up: Meet Kathy Howell, Vice President of Human Resources at Lexington Medical Center. She’s also a married mother of 3, with a grandbaby on the way. This race will be her first half marathon. I blame my daughter Melissa and my friend Ellen for planting the idea that I could, maybe, run. You see, I never ran further than the mailbox to get the mail in the rain. But one July day in 2008, my daughter mentioned that she was starting the “Couch to 5K” program and that she thought I might like it, too. Me? Run? I jokingly mentioned it to my much younger neighbor, Ellen. She jumped all over it. I got caught up in their enthusiasm and was flattered that these young women thought I could even attempt something like this, so thought I’d give it a try. I could always quit, right? I couldn’t even run 1 minute steady on the treadmill. But that’s the beauty of “Couch to 5K”. You walk more than you “run” until you build up your ability to run more than you walk. And in a matter of 10 weeks, I could plod 3 miles. Enough for a 5K. True to her word, Ellen took me out for my first 5K in November of 2008. The Sleigh Bell Run at Saluda Shoals. Here was the problem: I’d never run a race before. I was mentally freaked out. But I finished it. 15 minutes later than Ellen, but I finished. 3 weeks later, Ellen and I ran the Jingle Bell Run in Camden. I improved my time by 3 minutes, placed 3rd in my age bracket (please don’t ask how many women were in my age bracket) and got my first runner’s patch. I was victorious! I had a patch to prove it. I was hooked. In October 2009, I ran the Ray Tanner 5K. Cheerleaders, music and when you crossed the finish line – which was home plate- they announced your name! I felt like a rock star! I did well enough to get another runner’s patch. Oh, Yeah. Up to this point, I’ve been a so-so runner. I limited my runs to the treadmill at the gym. Always stayed at 3 miles. Never more than 9 miles/week. Until July of 2010. That’s when I heard about LMC’s sponsorship of the Governor’s Cup Race. I thought this was a great idea and that I might consider doing the 8K. I had plenty of time to work up to 5 miles. I liked having an event on the calendar that I could plan and work toward. Plus, it would show support for my company. I’m in. And then it happened. I was in a group of colleagues at the gym. They were all talking about the race and what they were going to do. I heard about a new race training program that Health Directions (Lexington Medical Center’s health and wellness facility) was putting together. Someone said, “Hey, Kathy. YOU should do this with us!” That felt good. These people think I can hang. I found myself caught up in the group energy and enthusiasticly said, “I’ll DO it!” OK! Half marathon it is! And then instantly, I felt the color drain from my face. Did I just commit to the half marathon? July 31st I met up with the running group for our first run. I was confident. We planned on running 2 miles. No problem. I knock out 3 on the treadmill easy enough. My confidence wheezed away in a hurry. Longest 2 miles of my life. I had to walk parts of it. My lungs burned. My legs quivered. How could this be?? I learned quickly that there is a difference between treadmill running and outdoor running. Big difference. I was discouraged, but with the encouragement of our running coach and my teammates, I stuck with it. I’ve been following the training plan for 7 weeks. I run 4 days/week with my long runs on Saturdays now up to 7-8 miles. 21 miles/week. 150 miles since August 1st. My goal for this year’s Governor’s Cup is simple, but important: To finish the race and train injury free. So far, so good. II have moments of pure fear when I think about running 13.1 miles. Last month I ran a 5 mile loop around the Statehouse and realized just how FAR 5 miles is. I ran from Health Directions in Irmo across the dam and back for my first 7 mile run. People DRIVE that. Maybe I should look for a car marathon. But there is something about running. Even in a group run, there is a sense of peaceful solitude. (Especially when you’re at the back of the pack.) I like that. I am surrounded by people all day. I’m a wife, mother, daughter, sister, friend, employee and boss. And while I wouldn’t give up any of those roles, when I run, I’m just a runner. I can focus on one thing. It’s simple. It’s basic. And fills my soul. Keep up with Kathy’s progress between now and November 13th with updated blog posts on training and cheer her along!